Put the flour, cocoa powder, sugar, baking powder, salt, and butter in an electric mixer with a paddle attachment (or use a handheld electric whisk) and beat on a slow speed until everything is combined. Whisk the milk, egg, and vanilla together, then slowly pour half into the flour mixture. Beat together and turn the mixer up to a high speed to get rid of any lumps. Turn the mixer down to a slower speed and slowly pour in the remaining milk mixture until the batter is smooth. Spoon the batter into the paper cases until two-thirds full and bake in the preheated oven for 20-25 minutes. A skewer inserted in the centre should come out clean. Let the cupcakes cool slightly in the pan before turning out into a wire rack to cool. Top the cupcakes with a swirl of chocolate frosting and decorate with Cake Angels Zillionaire Sprinkles. Make meringue buttercream and colour green. 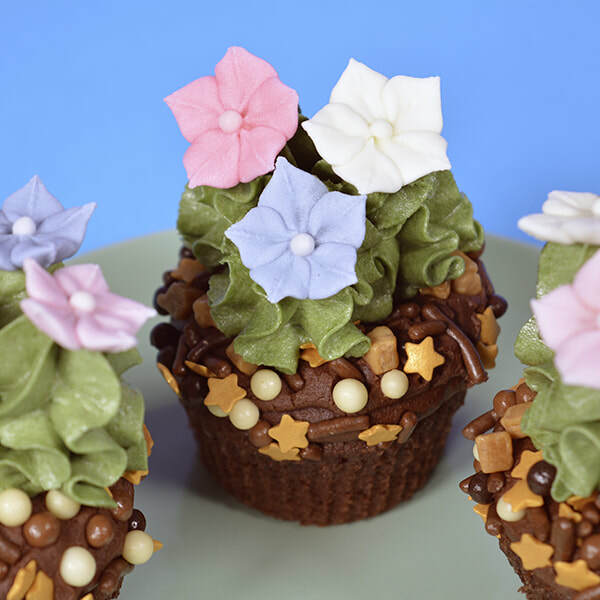 Using a star nozzle pipe the buttercream by holding the bag vertically and squeeze out gently, slowly lifting the bag away from the cupcake until you have your desired size of cactus, repeat 2/3 times on the top of each cupcake. Decorate using Cake Angels Flower Power royal icing decorations.